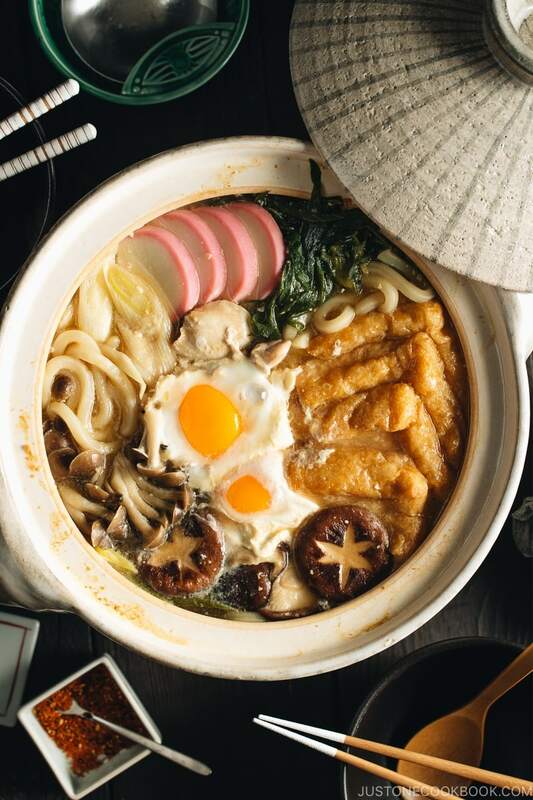 Miso Nikomi Udon is a hearty and comforting noodle soup where chicken, fish cake, and udon noodles are simmered in a miso-flavored dashi broth. When it’s cold outside, this noodle soup will warm you inside out. 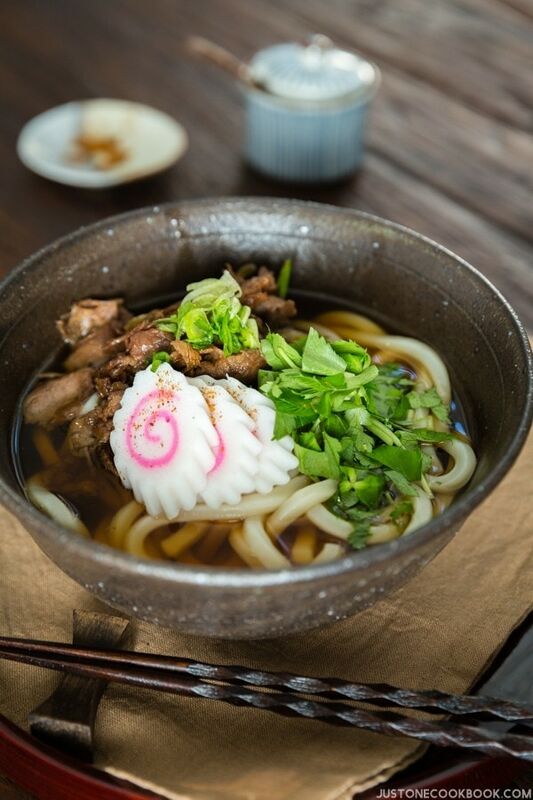 Most udon noodle soups are served in clear dashi broth seasoned with soy sauce. 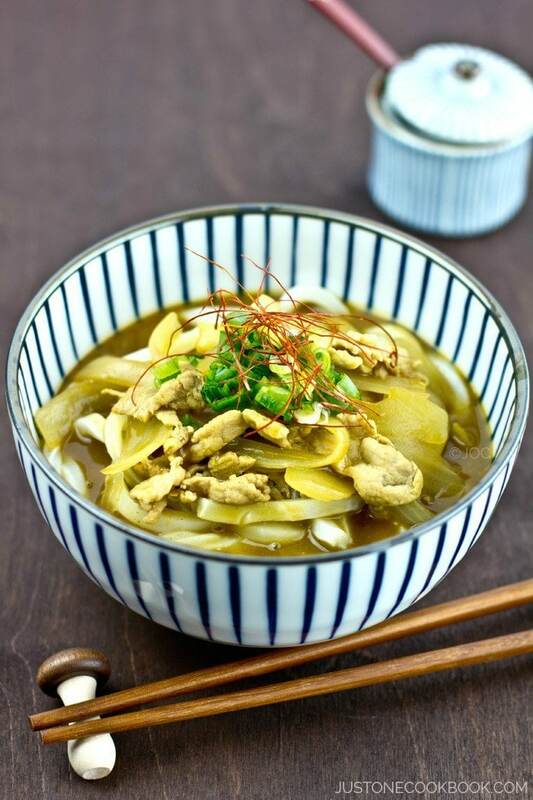 However, in Nagoya region, where Hatcho miso is known for, you can find delicious udon noodle soup flavored with miso, called the Miso Nikomi Udon (味噌煮込みうどん). It’s deeply savory and topped with an assortment of ingredients. Hungry? Let’s reach for the tub of miso and whatever ingredients you have in the refrigerator and make this tonight! What is Miso Nikomi Udon? 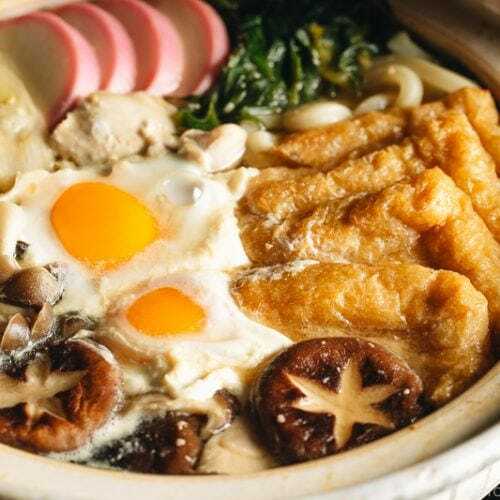 A popular “regional” food in Nagoya, Miso Nikomi Udon is also widely enjoyed across the country, using different types of local miso. 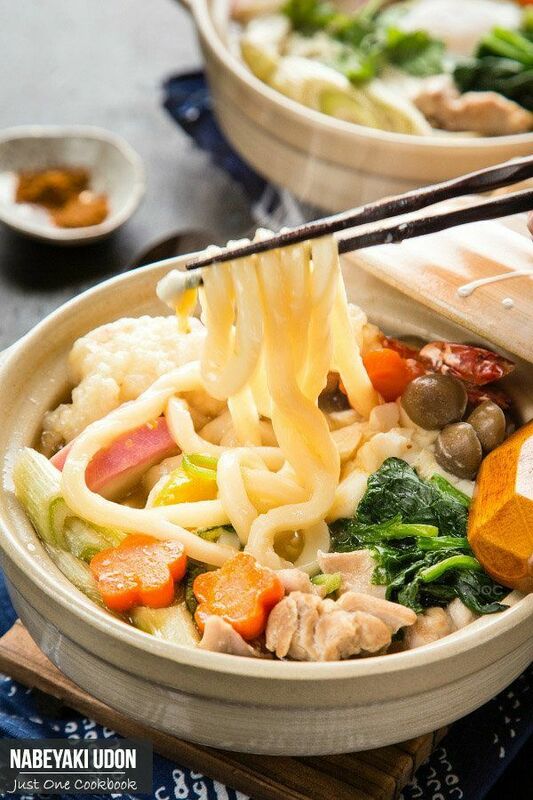 The noodle soup is usually served in individual donabe (Japanese earthenware pot). When the food arrives at the table, the soup is boiling, with lots of bubbling going on, and so much steam coming off from the pot. 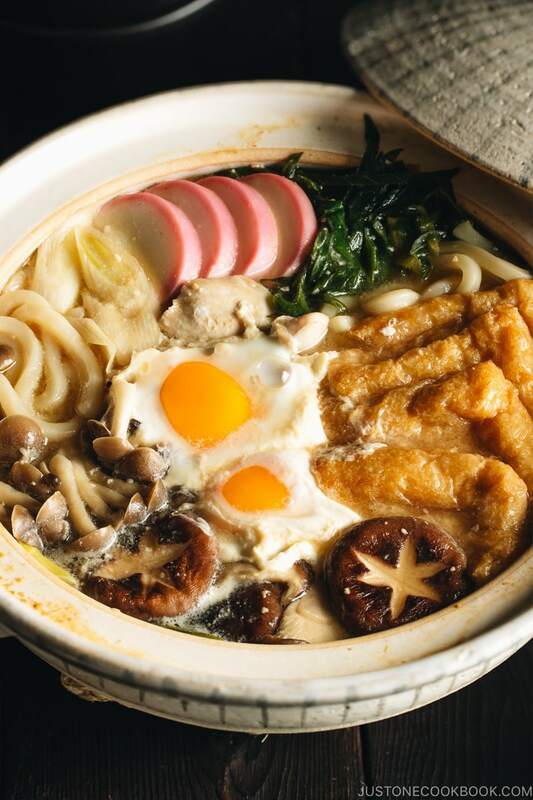 Inside the steamy pot, you have chewy udon noodles, chicken, egg, fish cake (kamaboko), shiitake mushroom, long green onions (negi), and deep-fried tofu (aburaage) in a savory miso-based broth. The broth is made with dashi, usually kombu dashi, katsuo dashi, or awase dashi (combination of the two). With the chicken being cooked inside the broth, you get some light umami-packed dashi and chicken flavor. The original version uses Nama Udon (生うどん), which means freshly made udon. Typically, udon noodles are made of 3 ingredients: flour, water, and salt. However, udon noodles for Miso Nikomi Udon are made of only flour and water. 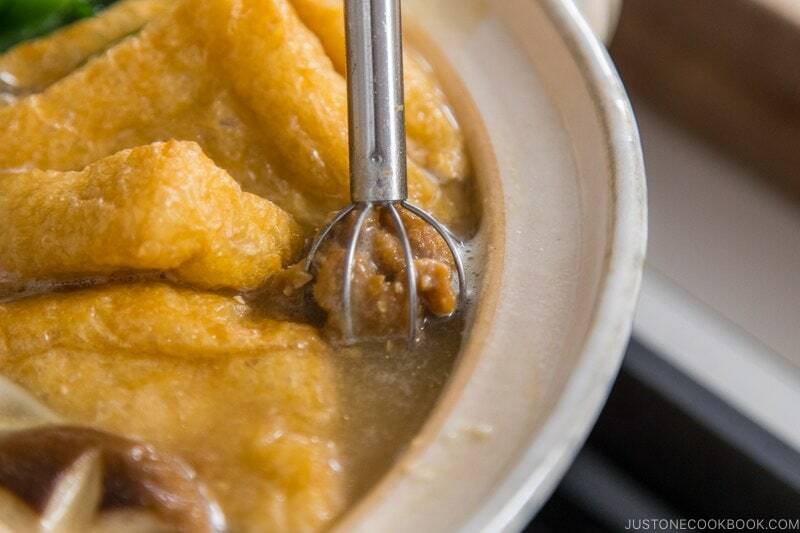 This reduces the salt content as miso gets salty after long simmering. I have a recipe for homemade udon noodles and if you have time, you should definitely make the homemade noodles first, and then make this Miso Nikomi Udon. That would be a fantastic meal! But that’s more like a weekend project. 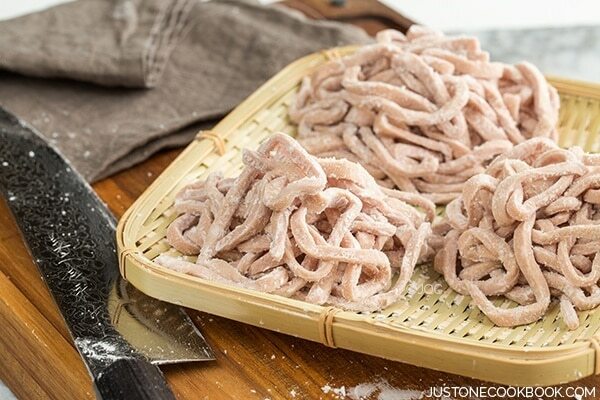 In this recipe, I use frozen precooked udon noodles from the Japanese grocery store so all you need to do is to run through hot water to separate it. I love using Sanuki-type udon for this recipe as it has a much chewier & bouncy texture. Some other udon noodles can be a bit more floury and doughy and break easily. If you use Kombu Dashi, this soup base is completely vegetarian and vegan-friendly! You have an option of using Katsuo Dashi or Awase Dashi (kombu + katsuo), but it’s all up to you. In this recipe, I have made dashi using dashi packets. You can find on Amazon (this is my favorite brand!) or your local Japanese grocery stores (I get mine from Nijiya). Typically chicken and egg are used for this recipe, but you can omit them and make it vegetarian/vegan-friendly by adding lots of veggies, mushrooms, and tofu! Living outside of Japan, ingredients can be hard to find. Long green onions can be replaced with white part of leeks and more green onions/scallions. Kamaboko, a Japanese fish cake, can be difficult to find, then try Chinese/Korean fish cakes from Asian grocery stores. Shiitake mushrooms may be hard to find, and if so, use other mushrooms available locally. 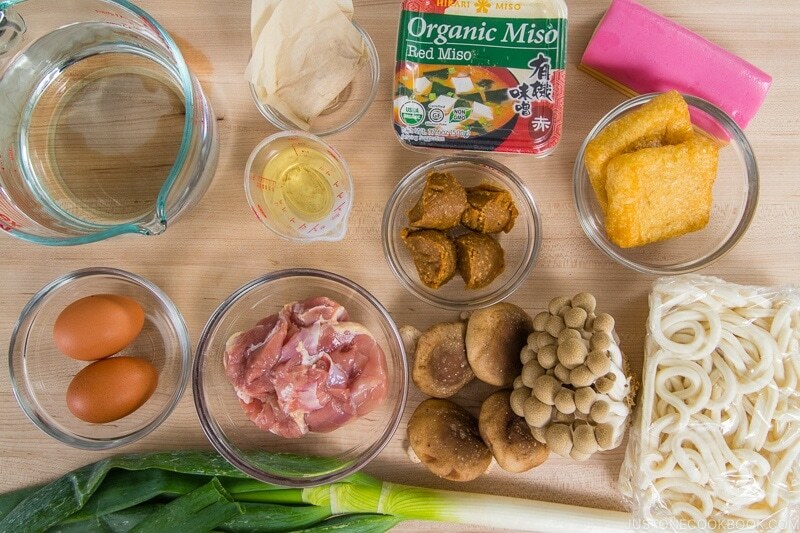 To summarize, use ingredients you have in hand that you think it’ll be delicious in the miso flavored broth. In Nagoya region, Mame Miso (豆味噌), or 100% soybean miso, like Hatcho Miso (八丁味噌) is used for Miso Nikomi Udon. Mame Miso is perfect for all types of simmering dishes because it doesn’t lose much flavor and taste compared to barley miso (麦味噌) or rice miso (米味噌). I used Hikari Miso® Organic Miso – Red Miso for my Miso Nikomi Udon, but Hikari Miso offers Hacho Miso and we tried it for this recipe as well. Mr. JOC and I love it, but our kids don’t like the stronger taste of Hatcho Miso, so they recommended us to use Red Miso instead. Hikari Miso’s miso are all made of 100% USDA Certified Organic rice and soybeans and is additive-free. It has a dark brown color original to Shinshu-style miso. A high volume of rice koji produces its mild taste and smooth texture. 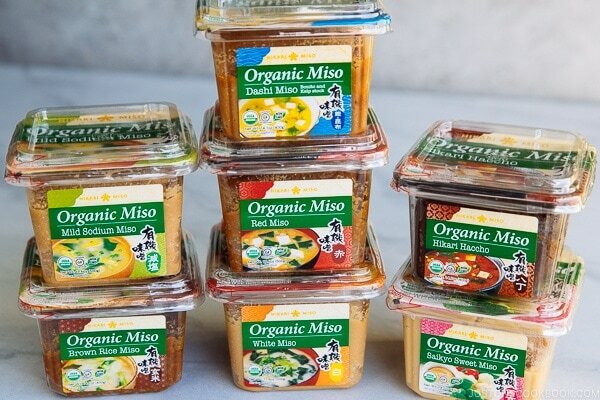 If you’re interested to try this miso out, you can purchase Hikari Miso® organic miso from most of the Japanese/Asian grocery stores or on Amazon. Hikari Miso® is my favorite brand of miso paste and I’ve been using for over a decade. 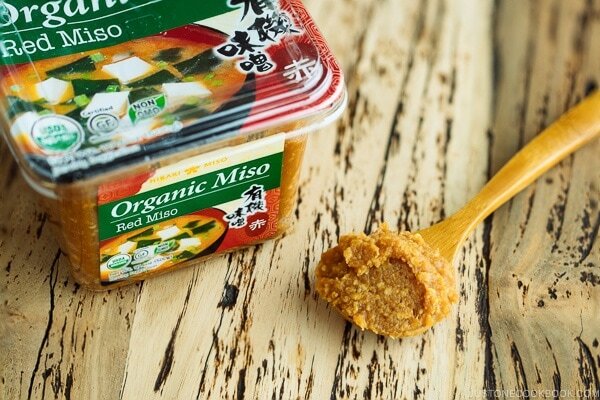 I enjoy using different organic miso from Hikari Miso®. There is also a variety of miso, each with a different flavor you can use for various purposes. When you make Miso Nikomi Udon, you can choose any type of miso you like. Each miso has its own unique flavors that you can experiment and enjoy. Do I need to Use a Special Japanese Pot (Donabe)? No, you don’t have to, but if you own a donabe, this is a good excuse to take it out and make this Miso Nikomi Udon. If you haven’t used it for a while, make sure to properly season before you start using it. Here’s my tutorial on how to season your donabe. If you don’t own one, then just use a big pot that can fit 3 cups (720 ml) water, udon noodles, and some ingredients for serving two people. You can use a bigger pot to double the recipe, or use half a portion for one serving. 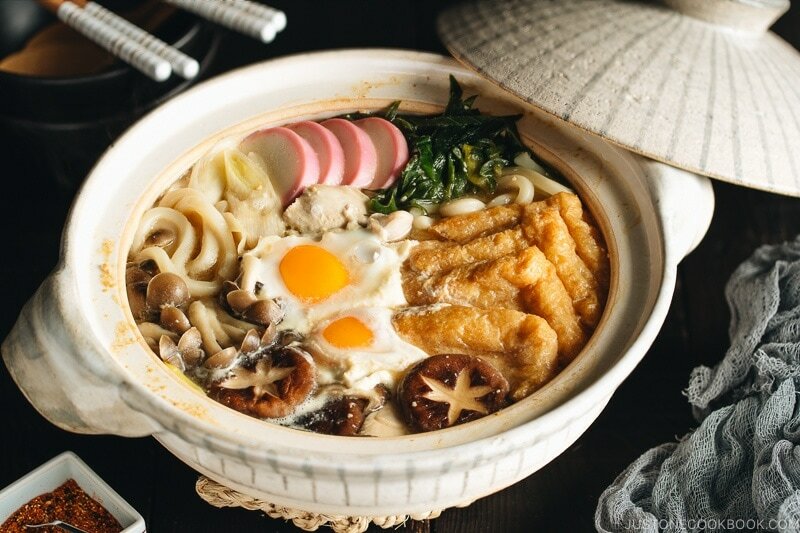 Miso Nikomi Udon is a very versatile noodle soup, where you can throw in any vegetables or proteins you have in the refrigerator. Here in this recipe, I used what considered “typical” ingredients for Miso Nikomi Udon so you know how it is commonly served in Japan, but please be flexible. 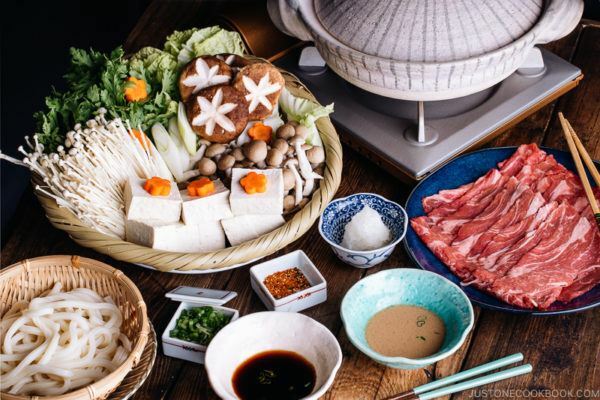 To keep it “authentic”, you will still need dashi (it’s an essential ingredient for what makes Japanese food authentic) and miso for this recipe. However, noodles, vegetables, proteins, and mushrooms can be replaceable. 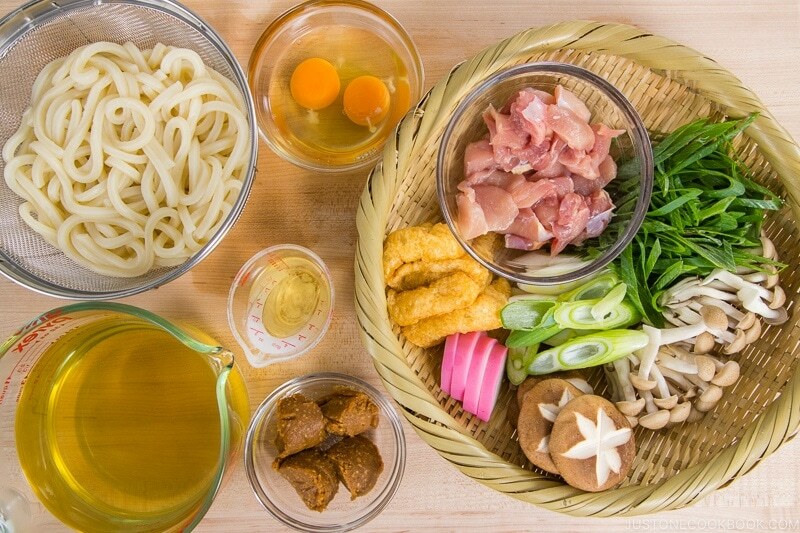 Have fun making your own Miso Nikomi Udon! 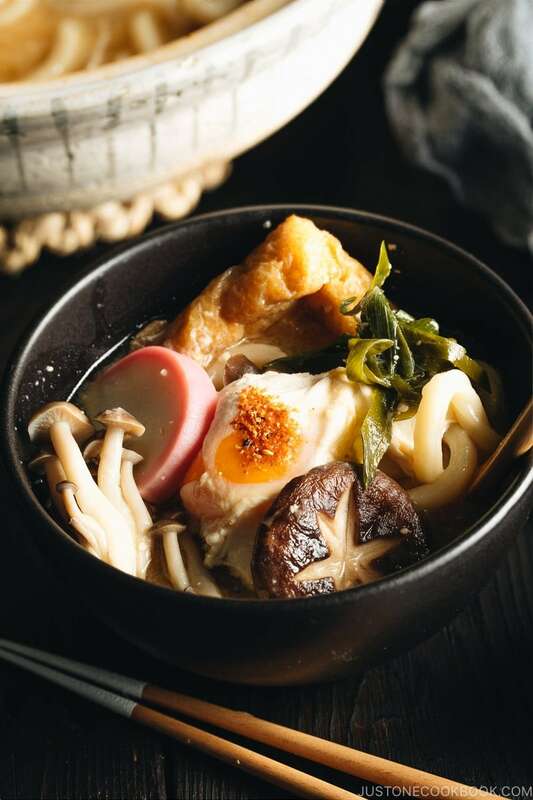 Miso Nikomi Udon is a hearty and comforting noodle soup where chicken, fish cake, and udon noodles are simmered in a miso-flavored dashi broth. 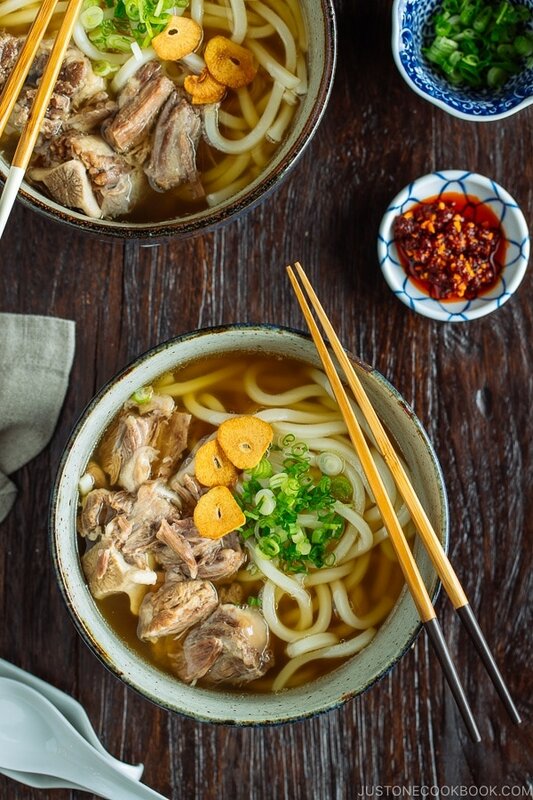 When it's cold outside, this noodle soup will warm you inside out. Make 3 cups dashi using one of 3 Ways to Make Dashi. Here I used the convenient dashi packet method. 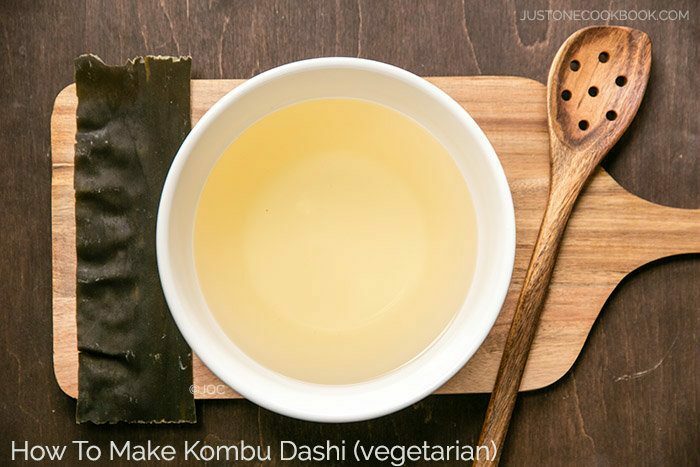 If you’re vegetarian/vegan, use Kombu Dashi. Cut the end of shimeji mushrooms and separate into smaller chunks. Cut the stem of shiitake mushrooms and cut in halves. I use “Sogigiri” Japanese cutting technique to increase the surface. If you like, you can make a decorative cut on the shiitake mushrooms. Here’s the tutorial. Cut Kamaboko fish cake into 4 slices. Cut the Negi (long green onion) diagonally, and separate white and green parts (we will add them to the pot at different times). Pour hot water over aburaage to get rid of the factory oil. Some people skip the step as the oil used is cleaner these days. I do it anyway to get rid of excess oil. [Optional] Cut into smaller pieces. I cut into triangles. Cut the chicken into smaller bite-size pieces. 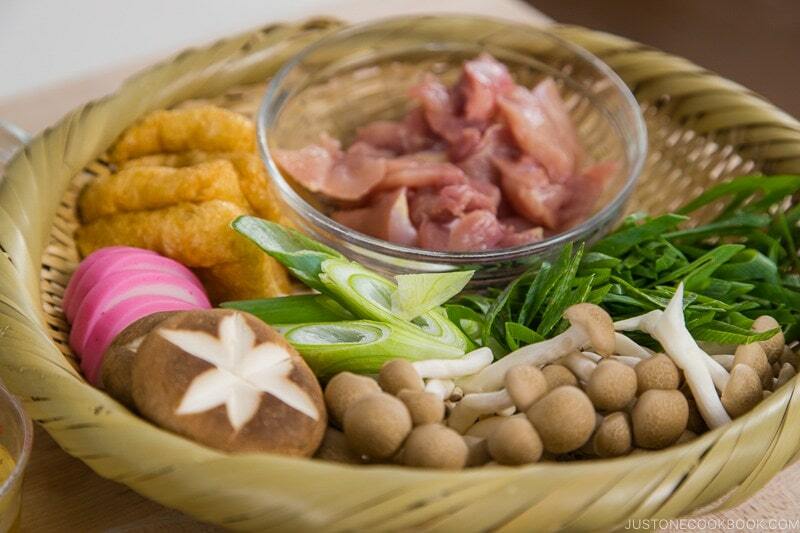 I use "Sogigiri" technique to create a bigger surface of the chicken so it will cook faster and absorb more flavors. Bring a pot of water to a boil. Add the frozen udon noodles and loosen it with chopsticks. As soon as they are loosened (30 seconds or so), drain the udon noodles into a colander and set aside. Crack eggs into a small bowl (so you won’t accidentally drop an egg shell into the pot) and make sure all ingredients are now ready to go! In a large pot (or donabe), add 3 cups dashi, chicken, and white part of negi. Cover to cook on medium heat for 10 minutes, or until the outside of the chicken is no longer pink (inside can be still pink at this stage). When boiling, turn the heat down to simmer. Skim off the fat and scum with a fine mesh skimmer. Add 3 Tbsp mirin and 3 Tbsp miso (keep 1 Tbsp for later. Why? Read my post.). I use a Miso Muddler and it works wonderfully to make sure miso is dissolved completely. You should place miso in a ladle and use chopsticks to let miso dissolve inside the ladle before releasing into the dashi. That way you can make sure there are no miso chunks left at the bottom of the pot. Add udon noodles, aburaage, shimeji mushrooms, shiitake mushrooms, and green part of negi. 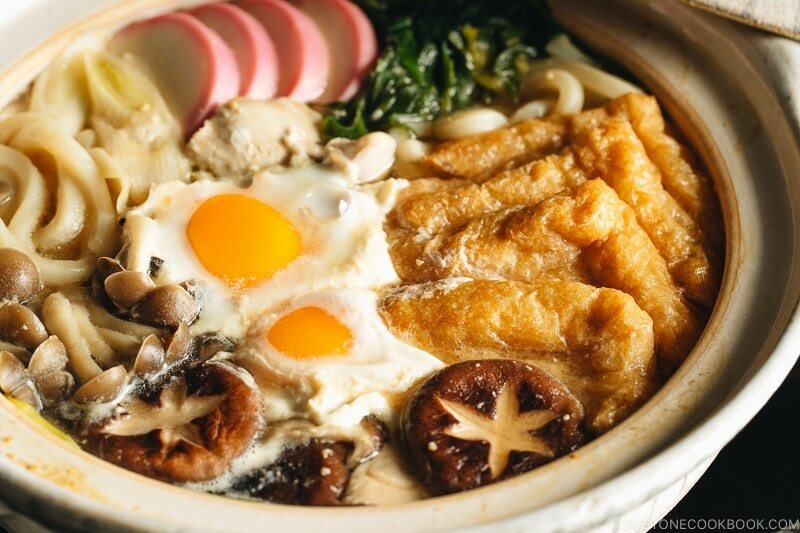 If you care about the presentation of this dish, now is a good time to place each ingredient and fish out the chicken pieces and place on top of udon noodles. Increase the heat to medium, cover with the lid, and cook for 5 minutes. When boiling, turn the heat down to simmer. 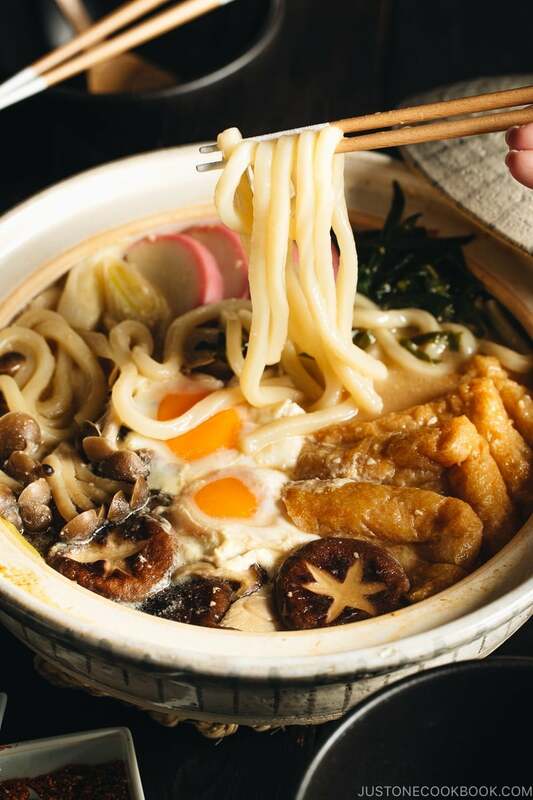 Once in a while, make sure to check udon or other ingredients are not stuck on the bottom of the pot, by inserting cooking chopsticks. Skim off the fat and scum with a fine mesh skimmer. Add 1 Tbsp miso in the soup. Be careful not to drop the chunk of miso. Use a ladle as a “mixing bowl” so you won’t lose the miso. Add kamaboko fish cakes (where it could have a nice color) and carefully drop the eggs in the middle. From this point, you do not want to cover with the lid (egg yolk will have a thin white coating when you cover). Cook for 2-3 minutes. Serve the pot at the table along with individual bowls. Serve in the bowl and sprinkle Shichimi Togarashi for a bit of spicy kick. Hi, Nami, it looks like the kamaboko is missing from the Ingredients List. Portland is cold now; I’m going to make this this weekend! Hi Lord Sakana! Thanks so much for catching it. I added to my ingredient list. 🙂 We have been eating miso nikomi udon too as it’s been pretty cold. It’s fun changing to different miso and ingredients. It’s a very comforting dish. Stay warm! My family was also divided by the haccho miso and the red miso. I loved the haccho (it reminded me of the misokatsu I used to order at Yabaton in Nagoya), while my wife preferred the milder red miso. Really liked the tip to pour hot water over the aburaage to remove the excess oil. Thank you for another great five-star recipe! Hi Lord Sakana! Haha! I really think the Hatcho miso is an acquired taste. I did not like it at all until I went to Nagoya and ate the miso katsu too. Hatcho miso was always too strong (it wasn’t sweet like miso katsu sauce) and I didn’t think it was delicious even a bit back then. I like Hatcho miso in miso nikomi udon because of the bold flavor. The regular red miso is okay but it seems like udon in a miso soup. I’m so happy you enjoyed it. Thank you so much for your kind feedback. Love your recipes, huge fan for a year and love cooking and trying them out. The Japanese pumpkin croquettes are my favorite. Fish cakes can be found in Asian grocery store (especially Japanese, Korean, and Chinese). This pink and white one is Japanese fish cake, but there are so many types of fish cakes that you can add into this noodle soup. 🙂 It does not have to be this specific one, if you have trouble finding it. When serving this do you dish out the broth first then allow others to take the ingredients they want, or do you dish out there broth and put a little of everything in each bowl? Also do you break the egg yolk before serving? 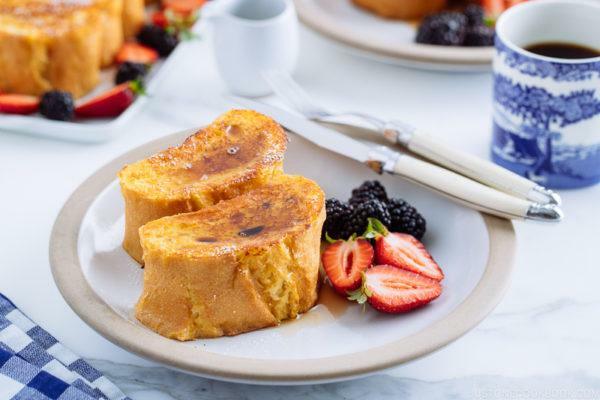 Thank you for sharing these wonderful recipes with us! Delicious! The ingredients list fit perfectly into my donabe. Hi June! Thank you so much for trying this recipe! I’m so glad your children enjoy this dish. 🙂 Haha, my kids are not huge fan of leek (negi) either. I always tell them they are sweet after cooking for a long time! 😀 Thank you for your kind feedback!